Wow, what a shocking end to such a well written character. 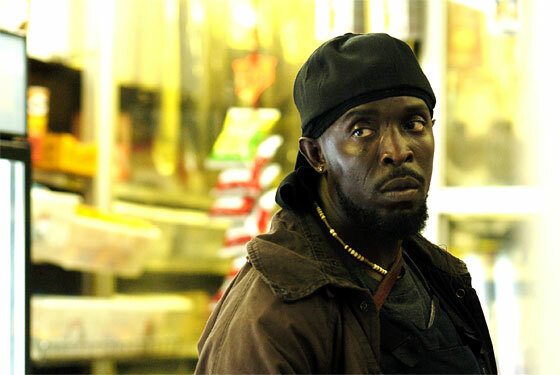 Omar escaped a well planned ambush and boldly limped around the streets in the face of the toughest street criminals. And who finally takes the man down? It was perhaps some of the best written television since Vladmir Zworkin and Philo T. Farnsworth invented the thing. And what are the chances this final season will finally get the well deserved Emmy® nod? We wanted to formally express our pride at fellow scribe Diablo Cody (the artist formerly known as Brook Busey-Hunt) for her Oscar® win. Diablo’s very first screenplay, for the hit movie Juno, went straight to the top. And we are sure that this sagacious young writer will do the same with her future screenplays. For those unfamiliar with Diablo, check out her bio on Wikipedia. Who the heck was KILROY?? In 1946 the American Transit Association, through its radio program, “Speak to America,” sponsored a nationwide contest to find the REAL Kilroy, offering a prize of a real trolley car to the person who could prove himself to be the genuine article. Almost 40 men stepped forward to make that claim, but James Kilroy from Halifax, Massachusetts had evidence of his identity. Kilroy was a 46-year old shipyard worker during the war. He worked as a checker at the Fore River Shipyard in Quincy. His job was to go around and check on the number of rivets completed. Riveters were on piece-work and got paid by the rivet. Kilroy would count a block of rivets and put a check mark in semi-waxed lumber chalk, so the rivets wouldn’t be counted twice. When Kilroy went off duty, the riveters would erase the mark. Later on, an off-shift inspector would come through and count the rivets a second time, resulting in double pay for the riveters. One day Kilroy’s boss called him into his office. The foreman was upset about all the wages being paid to riveters, and asked him to investigate. It was then that he realized what had been going on. The tight spaces he had to crawl in to check the rivets didn’t lend themselves to lugging around a paint can and brush, so Kilroy decided to stick with the waxy chalk. He continued to put his checkmark on each job he inspected, but added KILROY WAS HERE in king-sized letters next to the check, and eventually added the sketch of the chap with the long nose peering over the fence and that became part of the Kilroy message. Once he did that, the riveters stopped trying to wipe away his marks. Ordinarily the rivets and chalk marks would have been covered up with paint. With war on, however, ships were leaving the Quincy Yard so fast that there wasn’t time to paint them. As a result, Kilroy’s inspection “trademark” was seen by thousands of servicemen who boarded the troopships the yard produced. His message apparently rang a bell with the servicemen, because they picked it up and spread it all over Europe and the South Pacific. 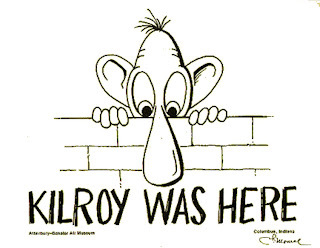 Before the war’s end, “Kilroy” had been here, there, and everywhere on the long haul to Berlin and Tokyo. To the unfortunate troops outbound in those ships, however, he was a complete mystery; all they knew for sure was that some jerk named Kilroy had “been there first.” As a joke, U.S. servicemen began placing the graffiti wherever they landed, claiming it was already there when they arrived. And as the war went on, the legend grew. Underwater demolition teams routinely sneaked ashore on Japanese-held islands in the Pacific to map the terrain for the coming invasions by U.S. troops (and thus, presumably, were the first GI’s there). On one occasion, however, they reported seeing enemy troops painting over the Kilroy logo! In 1945, an outhouse was built for the exclusive use of Roosevelt, Stalin, and Churchill at the Potsdam conference. To help prove his authenticity in 1946, James Kilroy brought along officials from the shipyard and some of the riveters. He won the trolley car, which he gave to his nine children as a Christmas gift and set it up as a playhouse in the Kilroy front yard in Halifax, Massachusetts. The following video from Reuters reveals something interesting... there is a town in Japan named Obama. And who do they support in the upcoming election? Do we have to say it? According to The New York Times, there were actually WMD’s in the Persian Gulf. But they are in Iran. Unfortunately, the Times article creates more questions than it seems to answer... but it strongly suggests that Iran is definitely up to some mischief. Meanwhile, we thought it would be a good time to mention the book, “Weapons of Mass Destruction,” that we wrote for the Powerhouse Ministry. There was an interesting article in The Star-Telegram, there was a serious lapse in security during a recent Obama campaign. According to the report, an order came to stop metal detectors and personal belonging checks about an hour after the gates were opened. According to a Texas television newscast, an Elmo doll began threatening to kill a child after its batteries were changed. You can see a video report at this Florida television station has video of the “threaten me Elmo” incident. The people are speaking and what they are saying is Barack Obama. Ten consecutive wins and it doesn’t look as if he is going to slow down. The Clinton campaign is responding with the slinging of ye olde mudd. But does being able to wage the nastiest sucker punches make a candidate better? For some people, that may be so. But, we think the majority of the American people will look at who is truly the best for our future. After Ted and Caroline Kennedy showed their support for Obama, the comparisons with JFK ramped up. Granted, Kennedy was jumping in to kick off the second half of the 20th Century... a young visionary taking over from an old war veteran. Kennedy was able to pick up and take over where Eisenhower left off. He was what was needed during a critical period of American history. The upcoming general election may very well be between a young visionary and an older war veteran. These are exciting times in American history! André Royo, who plays our favorite junkie, Bubbles, is one of the warriors from the future, fighting terminators under the command of the future John Connor. Just give him some crack. Or, since it is the future, perhaps he would go for what the Jem’Hadar are hooked on, Ketracel-white. But seriously... we are glad to see another HBO graduate on this show (the other is Garrett Dillahunt from the dirty western Deadwood). Too Broke to Eat Healthy? 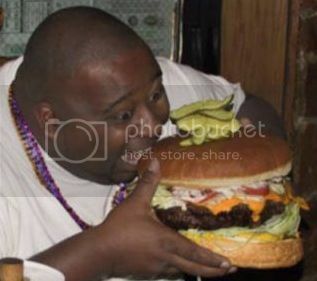 I noticed an article where someone said they couldn’t afford to eat healthy food because it cost more. At first I thought that was a cop-out. Then, I noticed that I was paying $5.00 for carrot juice when the equivalent amount of soda (which is sugar and acidic water... basically, sweet tasting poison) cost a fraction of that amount. Perhaps you remember our blog about the terrorist version of Mickey Mouse that taught young children to wage war against Israel. Well, the Disney clone met his demise last summer. However, a new Palestinian children’s program is using Warner Brothers clones to attack Israel. Assod the rabbit and his friends is the latest attempt at convincing youngsters in the Arab world the elements of hatred and warfare. According to Anorak News, the name “Assud” means Lion. And we hope those poor kids over there don’t bite the lion (line). Check out the video below. If this is how Palestinians do Sesame Street, I would hate to see their version of The Electric Company. We also saw on CNN that a recent bombing in Baghdad involved two mentally disabled women who unwittingly carried bombs that were remotely detonated. Visit the CBS Primetime Web Site to see more details. A man has 50-yard-line tickets for the Super Bowl. As he sits down, a guy comes over and asks if anyone is sitting in the seat next to him. Are we looking at the 21st Century Camelot? The WGA Strike has ended! Now... time to get to writing! Those of you who stayed up to watch the Grammy® Awards saw that Barack Obama beat former presidents Bill Clinton and Jimmy Carter to win best spoken word award. Also nominated in the same category was poet Maya Angelou and actor Alan Alda. WGA Strike: Soon to End? The New York Times reports that the Writers Guild strike may soon be over. Of course, we have heard it before and hope that it is finally true. It is a commonly known fact that writers are almost as welcome on a movie set than the person who cleans up after the craft services folks. Writers may never get much respect... but at least we should get our fair bit of crust from the pie. You can click any of the items above to see more. FREE shipping on fine jewelry and watches at Fortunoff.com. Offer valid through 2.14.08. Microsoft Offers to Purchase Yahoo!